December 1, 2015: Chris Dimino's Keyboard Waffle Iron has taken off to the extent that additional batches have been manufactured! Keep up with this success story (and new recipes) at thekeyboardwaffleiron.com. To order one, click on BUY at the top. November 30, 2015: Lordy, mercy... was this necessary? Dave's Beard @davidmlbeard. As Dave would say, "This is why the rest of the world hates us." November 30, 2015: This was Dave's annual visit to Ball State. The Ball State Daily has a timeline. Follow the action on Twitter at #DaveatBallState. Also, have a look at David Letterman talks experience at Ball State visit. November 30, 2015: Hello again. I've distilled some content from my Video Archives to create a Thanksgiving Edition. You'll find 16 videos, including Thanksgiving pie guessing with Dave's mom, and staff Thanksgiving dinners. Free admission! November 15, 2015: The Waldorf-Astoria Hotel was the site on Nov. 14 of a fundraiser for the Michael J. Fox Foundation for Parkinson's research. David Letterman, IndyCar enthusiast, was present, along with a bunch of other celebrities. I have the highest admiration for Michael J. Fox. Denis Leary's Twitter account has lots of coverage. For example, here's Denis with Dr. Emmett Brown! November 6, 2015: Our friend Steve Young is keeping busy. 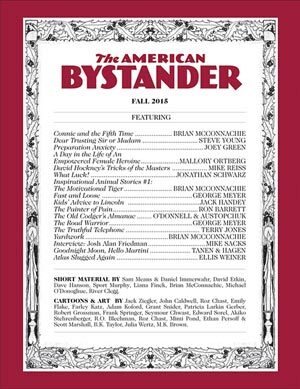 He's involved with a new comedy magazine, American Bystander. It's not available at the moment. There's a Kickstarter campaign underway. The only way to get the first issue is to donate to the campaign, from $5 to thousands. Steve has something in the first issue. Watch this video from Mike Gerber, publisher. November 5, 2015: You of course remember TV's David Letterman. Here's a little clip of him (with Harry) signing autographs somewhere or other. (YouTube). Harry's 12th birthday was on Nov. 3. October 24, 2015: We all know the video of a Monkey Washing a Cat. Here's Pete the Monkey washing pans. (story) (YouTube) Pete was promoted from babysitting to the dishroom. September 25, 2015: Well, it looks like I'll be getting Netflix, the only source for A Very Murray Christmas, Bill's upcoming movie. September 25, 2015: Brand new: Barbara Gaines has set up a blog on Tumblr, entitled "I Once Had a Big Job." 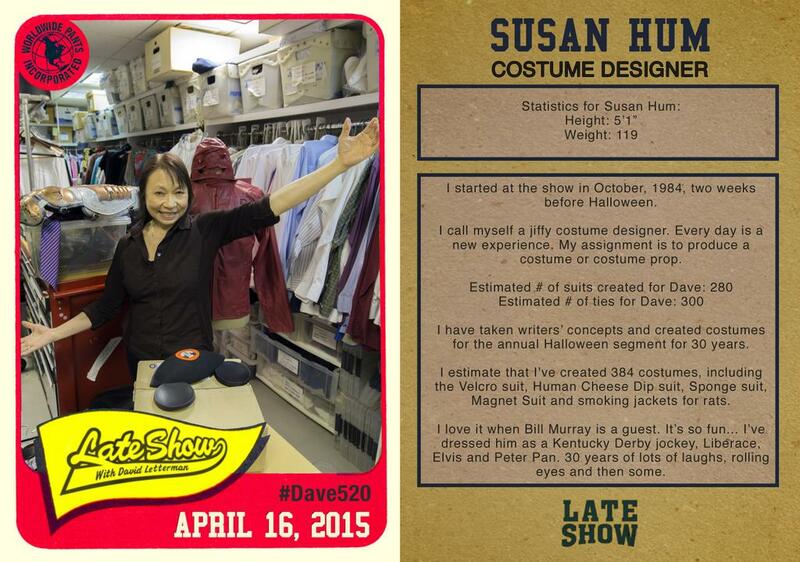 Her first entry is a transcript of her interview with the @ByeLetterman gents. Stay tuned for more good stuff. 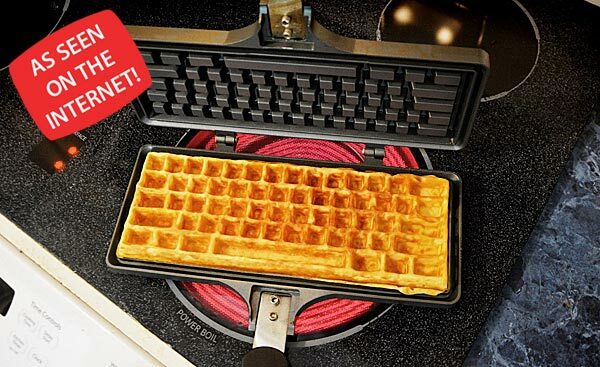 September 25, 2015: It's your latest Keyboard Waffle Iron reviews and links! September 21, 2015: Do you enjoy worlds? You'll find none better than Steve Young World, a new offering from longtime Letterman writer Steve Young. You'll see a link to his Everything's Coming Up Profits, his book about industrial musicals, in my left-side navigation column. You'll see a link to CelebriGum gallery, if you raise your eyes an inch or two. Do not miss Steve's songs, with the awesomely disturbing "Turkey Processing Song" and "Unsanitary Manger." 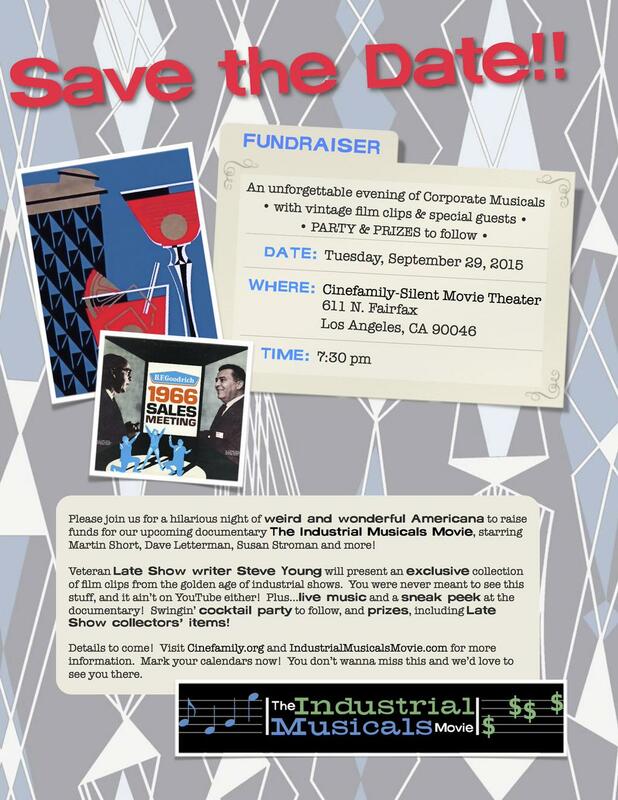 September 29, 2015: Our friend Steve Young is keepin' busy. July 25, 2015: From March 1993, it's David Letterman's visit to WRAL-TV, taped three months before the end of Late Night. July 11, 2015: A big comedy night for Marty and me in San Antonio. Surprise guest, David Letterman. 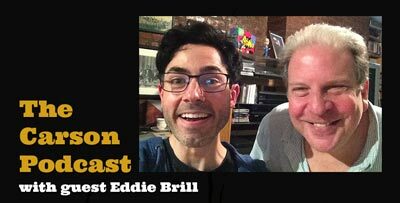 June 20, 2015: Catch up with Eddie Brill in his 48-minute visit on The Carson Podcast, with host Mark Malkoff. June 19, 2015: I was sad to learn of the passing on June 18 of Jack Rollins, Dave's first executive producer. (story) We saw Jack often on Late Night, during Dave's frequent visits to Hal Gurnee's control room. Jack, who lived to be 100, managed Woody Allen, Billy Crystal, Martin Short, Robin Williams, Joan Rivers and others. June 9, 2015Barbara Gaines has written a fascinating feature for the Huffington Post. It includes her insider's view of the early days with Dave, on through to a play-by-play of producing the epic final montage and final episode of the Late Show. May 26, 2015: Here's an item I was afraid was lost to the ages. Mike McIntee, without the ability to post on cbs.com after the May 20 final episode, took to wordpress.com to post the last-ever edition of the Wahoo Gazette. On May 11 I got to thank Wahoo Mike for how much he added to our Letterman experience over the years, with really funny takes on the show's events, historical tidbits, behind-the-scenes happenings and his own real-life stories. The Wahoo gave us a VIP insider's look at how each episode came together, staffers scrambling to pull together background information on a topic Dave pulled out of thin air, etc. I don't know of any other show that has ever done something like this. I think it was an awesome way to draw viewers in to the show. I'll miss the Wahoo so much! Be sure to check out Mike's new blog on wordpress.com. May 26, 2015: An event that is both easy to understand and puzzling, buzzfeed.com has reported that all of Dave's videos have disappeared from cbs.com and YouTube. We've known all along that Worldwide Pants Incorporated owns the copyright to Dave's CBS shows. It's not especially surprising that CBS would stop serving out Dave's material, but many fans and I can't comprehend why all the videos on YouTube have evaporated. This is a huge loss. It leads one to think that Worldwide Pants intends to offer episodes or clips for sale, and therefore doesn't want to compete with itself. That's the only reasoning I can come up with. May 26, 2015: What will you be doing after May 20, when there's no more Dave, and your television viewing days come to an end forever? Don't spend your days sulking and whining. Well-adjusted, law-abiding former television viewers will be making nutritious rectangular waffles, and watching vintage Dave clips on YouTube. Don't risk electrocution with an electric waffle iron! 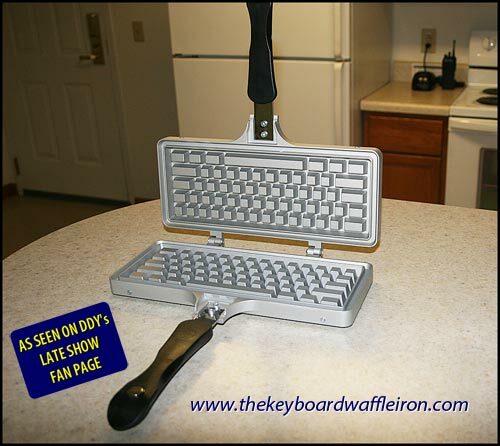 Be the first on your block to have your own Keyboard Waffle Iron, created by Late Show Graphic Art Director Chris Dimino! Just say no to boring, 20th-Century round waffles. I pre-ordered mine in December! May 26, 2015: This just in! Here's a feature on Chris and the Keyboard Waffle Iron on Ann Nyberg's Network Connecticut, including YouTube. We'll try to excuse her for saying Late Night. May 24, 2015: This is amazing. It's a Google Maps 360° look at the Late Show set. May 23, 2015: Letterman Fan Details Every Frame in Final Show Montage is offered by Rolling Stone. It's the work of Adam Nedeff, and you're sure to enjoy it. Here's the direct link to Facebook. May 23, 2015: My sadness about the end of it all is equaled by a great sense of pride to have been a fan of David Letterman's shows. The final montage of 579 clips is no surprise, coming from the talented creative and technical staff who surrounded Dave. The montage was a massive undertaking by a number of people, in the final days of their jobs. It demonstrates both the loyalty and skill of the people who produced it. Our sadness comes not just from no longer getting to see Dave front and center five days a week, but how much we will miss the tremendous talents of Paul and the CBS Orchestra, and many, many other staff we've come to know and admire. To those who ask over the days to come how I'm feeling: I will say that I'm proud to be a fan of the show, and to have been associated with the exceptional group of staff and fans I've come to know over the past three decades. May 15, 2015: Jon Stewart, in a desk chat on May 14, had a sincere and funny tribute to Dave on his The Daily Show. May 1, 2015: Joe DeLillo in The Orange County Register has a fine column, "David Letterman's retirement will leave an emotional void for fans." Gerard Mulligan and Steve Young offered interesting insight. May 1, 2015: Look! Conan O'Brien has written a highly complimentary feature for Entertainment Weekly, posted on 5/01/15. I think it's great writing, as well as being a nice tribute to Dave. May 1, 2015: Don Giller and I were interviewed last week by one of the proprietors of @ByeLetterman. It's a print interview, so don't get overly excited about seeing us. We talk about our fan careers, and our favorite things about Dave's shows. 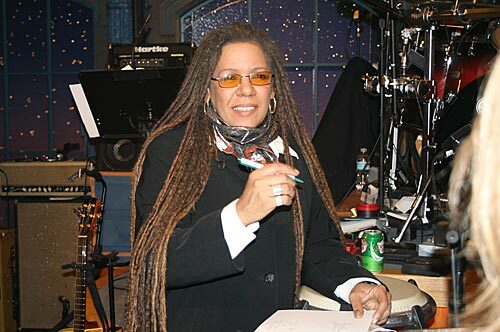 March 23, 2015: @ByeLetterman has posted A Chat with Barbara Gaines, the latest in their series of interviews on Letterman topics, including Tom Shales, Randy Cohen and Gerard Mulligan. 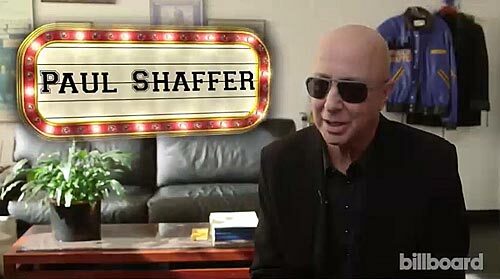 March 22, 2015: Bill Scheft's ABlog the Author for March 22 has his thoughts on why Norm Macdonald is funny. 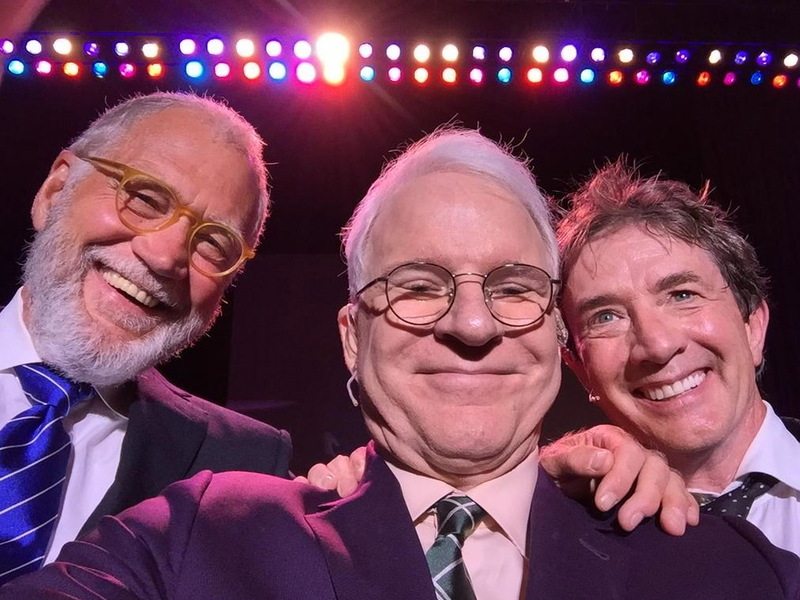 March 19, 2015: "David Letterman and Norm Macdonald Demonstrate How a Talk Show Should Work" is the title of an opinion by critic Ken Tucker for Yahoo. Dave let Norm take the lead, which of course wouldn't work with every guest, but after 25 appearances with Dave, Norm's well capable of doing so. My favorite was Norm's commentary about "What happens in Vegas stays in Vegas" vs. gossipy small-town whores. March 3, 2015: A long list of Dave's final guests has been announced by CBS, including Alec Baldwin, George Clooney, Billy Crystal, Robert Downey, Jr., Will Ferrell, Tina Fey, Michael J. Fox, Tom Hanks, Jack Hanna, Kevin James, Scarlett Johansson, Michael Keaton, Steve Martin, Bill Murray, Sarah Jessica Parker, Don Rickles, Julia Roberts, Ray Romano, Paul Rudd, Jerry Seinfeld, Martin Short, Howard Stern, John Travolta, Bruce Willis, Oprah Winfrey and Elvis Costello. It's quite a fine line-up. Conspicuously missing are Tom Brokaw, Jennifer Lawrence, Amanda Peet and Barbara Walters. From the list above, I'm most excited about Bill Murray, Martin Short, Tina Fey and Bruce Willis. I hope like everything that no politicians are invited on these final shows. The ultimate coup would be to get Bruce Springsteen to sing "Glory Days," the last performance on Late Night with David Letterman, on June 25, 1993. Watch a compilation of these tributes to Michele from Bob Costas, Keith Olbermann and David Letterman. (YouTube) If you visit the Late Show, you'll see Michele's picture to this day, not far behind Dave's desk. 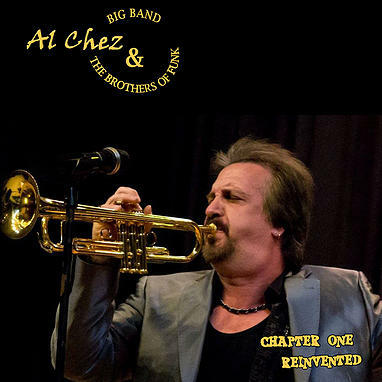 January 30, 2015: This just in: Trumpeter extraordinaire Al Chez and his band, Al Chez & The Brothers of Funk, have just released a new CD, Chapter One: Reinvented. Check it out, along with caps, shirts and other merchandise. We miss you on the Late Show, Al. January 25, 2015: Here's a wonderful feature on Felicia Collins, and her introduction to the guitar as a girl. She taught herself how to play! January 25, 2015: Rob Burnett is producing a movie, The Revised Fundamentals of Caregiving. It's in pre-production at this point. Selena Gomez has joined the cast.